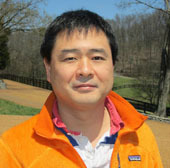 Terunaga Nakagawa, M.D., Ph.D., associate professor of Molecular Physiology and Biophysics, has received a two-year, $100,000 grant from the Brain and Behavior Research Foundation to continue his studies of the molecular underpinnings of autism and other brain disorders. Nakagawa is one of 40 mid-career scientists from 10 countries to receive 2017 NARSAD Independent Investigator grants from the foundation formerly known as the National Alliance for Research on Schizophrenia and Depression. “This award is great recognition of the rather unique combination of technical skills that Dr. Nakagawa can apply to fundamental molecular questions about how the healthy brain works, and what might go wrong in complex neuropsychiatric disorders like autism,” said Roger Colbran, Ph.D., professor and interim chair of the Department of Molecular Physiology and Biophysics. Among other projects, Nakagawa has been investigating the AMPA receptor, a glutamate receptor complex that plays important roles in mediating synaptic transmission and brain plasticity. He has developed a purification method to isolate intact AMPA receptors from the brain so that he can learn how these macromolecular “machines” organize the structure and function of the synapse. The NARSAD grant will support studies of GSG1L, a membrane protein and component of the AMPA receptor that was discovered in his laboratory in 2012, and which has been linked to autism spectrum disorder (ASD). Deciphering the basic biology of this protein may lead to the development of novel drugs to treat ASD and other brain disorders.